Madison District Public Schools (MDPS) is a small urban school district in southeast Michigan. The district, about three square miles, sits in Oakland County, about 13 miles from downtown Detroit. Enrollment in the district encompasses 1,250 traditional students, 775 non-traditional learners, and 450 students through their charter school. Being this close to Detroit, MDPS welcomes over 300 School of Choice students from the Detroit Public Schools system and an additional 200 from the surrounding area. Of the total enrollment, 20% are mobile, meaning they move between districts from year to year. One hundred percent (100%) of the students enrolled in the National School Lunch Program are eligible to receive free meals. Students speaking English as a second language account for about 20% of their population. Over 85% of the students are considered economically disadvantaged. “The playing field is not level for these students,” shared Randy Speck, Madison’s Superintendent. The high school had been on the state’s priority list for having test scores in the bottom five percent of the state. Through changes made in the district over the last several years, the high school was released from that list when they reached 36% in 2014-15, and the district continues to improve. In Madison, every kid matters, as expressed by Randy. “We work with every student as an individual as we encourage them that they can do better and boost their confidence.” The district continues to look for opportunities to provide more options for students. Current options include traditional elementary, middle, and high school programs, an alternative school, a virtual academy, a home school partnership, a charter school, and the Michigan Advanced Manufacturing Collaboration program. Providing a variety of options allows the district to personalize education for each student that enters their doors. In a district that has struggled financially, offering a competitive wage to teachers and staff is difficult. Most districts in the surrounding area have higher staff salaries. Staff turnover used to be high, but MDPS has created an environment to attract and keep teachers/staff that has reduced the outflow. This has been done by offering teachers non-financial incentives such as being a lead teacher or presenting on professional development days after a year of working in the district. The administration is also very open and transparent about where the district is and where they are heading so teachers know what they are signing up for when they interview with Madison. The district’s vision is “to be a high achieving, premier, small public school system recognized for providing rigorously challenging and culturally diverse education and meeting each student’s learning needs.” They focus on telling kids they matter and have the ability to do great things, then follow up with providing a variety of opportunities for them to learn. Caring individuals in each building want to help kids succeed in life and there is a strong emphasis on building relationships with every student. This mentality, along with their motto of ‘Serving Families One Student at a Time’ is what will continue to drive Madison District Public Schools further along the achievement scale. The following information describes ways in which Madison is serving their families and students. Last year less than 30% of Madison Elementary School students passed the M-STEP. The gaps in their students’ learning could be attributed to the poverty in the area. It could be attributed to a transient population where students go from one school district to another. Some may blame not having technology in the hands of every student. But the staff at Madison Elementary are not pointing any fingers. They have developed a plan to close the gap and are determined to increase M-STEP scores this year. Madison Elementary School’s goal for 2016-17 is to reach 50% proficiency on the M-STEP. To accomplish this, a team of teachers puts together a plan based on student data. They use Northwest Evaluation Association (NWEA) assessments three times per year and enter the data into Illuminate, a data warehouse software. Using Illuminate, the teachers are able to group students by their NWEA RIT scores (students’ level of achievement in particular subjects regardless of grade level). Then they develop whole group lessons, mini-lessons, and small group work, where the small groups are based on RIT bands (a range of scores). This process is repeated throughout the week. Amy Webb, Developmental Kindergarten Teacher and elementary data person, worked with a third-grade team to test this process for three weeks after which their students retook the test. The results showed a lot of growth. This encouraged the teachers to continue to use the data as they worked with each student, moving them toward the “magic NWEA number” that equates to passing the M-STEP. Students also got excited when the teachers shared the data results with them, which allowed the teachers to help students set goals and develop a plan to achieve them. Because of the data, the third-grade teachers are communicating better about their students. They are talking about the data as it relates to their students’ learning throughout the week. It has also helped them reflect on their own growth as a teacher. When they look at the data and see another teacher having success in a certain area, they ask how they can improve to increase their own students’ growth. Last year’s M-STEP results caused Madison Elementary’s staff to take a closer look at how they could serve their families. For the well-being of their students, a change needed to be made. This sense of urgency to close the achievement gap led them to focus on each individual student by using frequent assessments and data to measure their growth. The results of this year’s M-STEP will show what is possible with targeted intervention based on data. Three short years ago, Madison High School had very few elective courses, zero AP courses, a 78% graduation rate, a high turnover rate of teachers and students, and daily behavioral/discipline events that required administrative intervention. 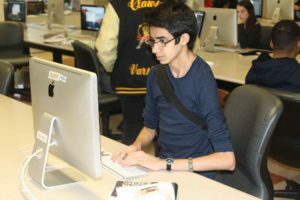 Now the high school offers a variety of elective courses including three AP courses (and seven more scheduled), has a 98.6% graduation rate, and has had less than 50 behavioral/discipline issues needing administrative support this year. Why the drastic improvement in such a short time? Ben Harwood, Assistant Principal and academic leader in the building, believes it is due to the rigor added to the curriculum. The high school reinvented themselves in the way they assess and engage students. Teachers are encouraged to allow retakes (restructured tests) on capstone and major tests. Since it is not always possible for students to come early or stay late, due to their responsibilities at home, teachers work with them to make it happen. One way is through targeted intervention during school hours. During their prep time, math teachers assist students individually or in small groups. Teachers also volunteer to come in on Saturdays to help students, and staff across the curriculum help kids become more familiar with state testing. 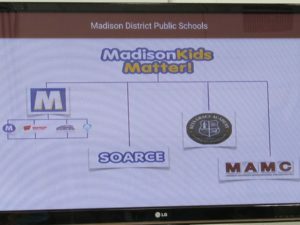 Increasing their course offerings to engage more students is also an improvement for Madison High School. 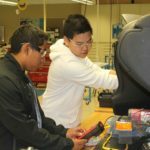 In addition to the seven AP courses scheduled to be rolled out over the next three years, the district is expanding their robotics and CNC programs, and looking at creating a five-year industry certification program in construction/building trades. The program would include introductory, carpentry, and advanced carpentry courses. A partnership with a local builder may also be on the horizon so that students can assist and/or build houses with his company. But changing the mindset of high school students in poverty can be difficult. Staff continually remind students that, “Creativity and intellect is not based on zip code,” said Ben, a previous teacher in the Birmingham School District. 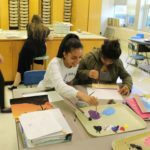 In addition to providing academic opportunities and options for students to visualize a future outside of their current circumstances, the high school has put more emphasis on developing relationships with all their students. Relationship building goes beyond classroom interaction and includes learning about each student’s struggles, hopes, and dreams. Since many of their students live in poverty, they assist their families with childcare and jobs to supplement the family income. Helping these students to visualize a future is imperative to the success of the students and the district. A unique way the administration has engaged students is to include them in the teacher hiring process. Since 2013-14, teacher candidates are required to teach a lesson to a cross-cut sample of students. Students provide feedback to the administration which is used, along with other traditional interview data, to make hiring decisions. 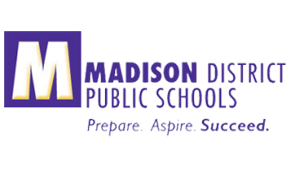 About 20 teachers at Madison High School have been hired since 2013-14 with student input. Another shift at the high school was changing the grading scale. Teachers researched options, decided on a 1-4 scale, and trained one another in how to use the new grading scale so they could explain it to students. This teacher-led initiative took away the stigma of letter grades and is just a first step as they plan to pilot standards based grading in the near future. Creativity and intellect apply to staff as well as students. 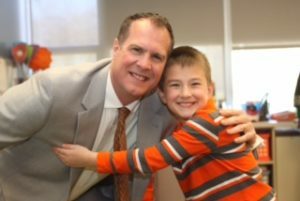 “Randy [superintendent] allows the staff the opportunity to try new things without a lot of red tape,” which is one reason Ben likes working for MDPS and why the high school has improved. Madison offers staff non-financial benefits which have reduced the turnover of teachers to local districts with higher pay scales. After a teacher’s first year, the administration may support their interest in becoming a department chair or teacher leader, encourage them to present at conferences, and allow them to provide professional development in the district. In many larger districts/schools, teachers usually need several years experience (sometimes five to seven) before having these opportunities. One of the district’s goals is that every student will walk off the stage at graduation with a plan. In order to do this, Madison High strives to provide educational experiences that prepare kids for life. By providing more options, developing relationships, targeting intervention, and keeping staff, “Kids are staying in the game longer,” said Ben. As students see the opportunity to have more chances at success, it is leading to more academic engagement and improved behavior, both necessary components to fulfill their plan. An educational experience Madison offers students is through their advanced manufacturing program, Michigan Advanced Manufacturing Collaboration (MAMC). In this program, students and adults can receive an industry recognized certificate, beneficial for getting a job with any company that uses FANUC robots and CNC machines with FANUC controllers. That is a pretty powerful skill-set to have considering FANUC Robotics is the leading global manufacturer of factory automation systems and whose America Corporation headquarters is in Auburn Hills, a short drive from Madison Heights. Dan Gilbertson, Director of Innovative Programs and Strategic Partnerships, oversees the MAMC program. As the previous high school principal, Dan understands making learning relevant for students. It was under his leadership that the high school made significant advancements in achievement. “The MAMC program is appealing to students for a variety of reasons,” he explained. “When they realize they can be making $40,000 by 20 years old and incur $0 in debt getting there, that’s a motivator.” Other students view the program as a stepping stone to further education. The high school started the FANUC certification program with high school students in Spring 2015. During the 2016-17 school year, 16 students enrolled in the program. Nine students in the fall completed the program and received their Level 1 license. One student shared he was planning on going into this field. “I liked the class because it was hands-on and the robot only does what it is told to do. I think I’d like doing that as a job.” Other students who received their Level 1 certification are pursuing engineering or technology degrees. Once Madison is approved to offer a Mechatronics program, high school students will have another early college and FANUC certification option. MDPS began the MAMC program because it can be a life-changing opportunity for many students, a viable career for some, and to fill a skills-gap in industry. Over the next 10 years, 3.4 million manufacturing jobs will need to be filled. Currently, only 1.4 million employees are qualified to fill these jobs. Most industries eliminated their apprenticeship programs which caused this 10-15 year skill-gap. Employers want skilled employees, but the training is just not available. Madison is preparing students for jobs that will be available as soon as they graduate. Adults can also be trained at the MAMC facility which is a FANUC certified training center and approved Michigan WORKS training center. When the program began, five adults enrolled and were the first to complete the program. The cost for an adult to take a FANUC certification course is $1,000. Courses are blended with the curriculum online and hands-on practice on the machines. The facility is located in a building currently shared with Madison Middle School and the SOARCE program. It includes an open learning lab for students to complete the online portion of their courses and to test their CNC programs in the simulator. Teachers are available to assist with the online curriculum and they teach the hands-on portion of the courses. Each teacher is a certified trainer and has FANUC certifications in Robotics and CNC curriculum. They also have extensive experience working with the machines. The FANUC Robotics program has three stackable certificates, beginning with the Robotics Level 1 Certification. 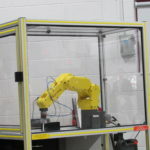 In this certification, students learn the skills needed to set up and program a FANUC robot. Students learn how to use the FANUC Roboguide and virtual workcell software to manipulate the robot. During this process, they learn a lot of patience as they gain an understanding of how to deal with problems that arise during the execution of the program. Students take a pre- and post-test, and a certificate is obtained with 75% proficiency. The second certificate is Robotics Level 2 IR Vision, and FANUC will have the Robotics Level 3 Integrated Automation available Fall 2017. To begin the CNC program, students take a proficiency assessment before beginning the introductory course. Once they achieve an 80% in the introductory course, they are ready to begin the CNC certification courses. 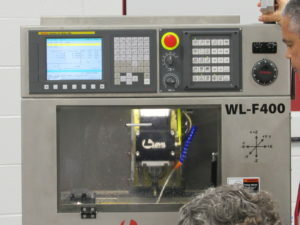 CNC certifications require students to create a program in the learning lab, test it in the FANUC CNC Simulator on the computer, take the program to the CNC machine, set up the machine, and print the piece. About 12-16 hours goes into each piece and students must satisfactorily complete four pieces to receive each certification. 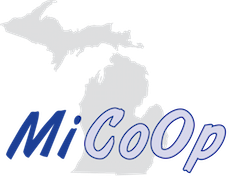 Through the Michigan Advanced Manufacturing Collaboration, MDPS is helping students and adults fill industry jobs by offering training and certification. 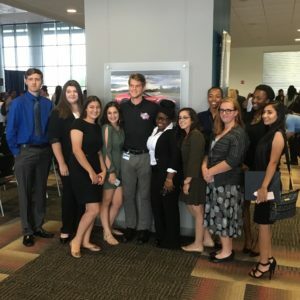 This personalized option allows high school students interested in this hands-on career to be trained and ready for the workforce upon graduation. Adults are offered a flexible program to learn new skills and move forward in their lives. As students and adults close the skills-gap by filling the open jobs, industry benefits as well. Madison Preparatory School is not like the typical alternative school of the past. 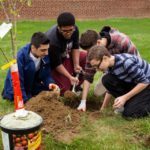 While it still provides a second chance for students to earn credit when they get behind, they are a community of learners, just like any other building in the district. 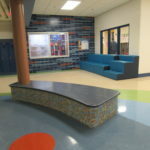 The smaller school setting, roughly 115 students, allows for more one-on-one individual attention and more focus on filling the gaps for the 14- to 20-year-old students who call this school home. About 50 of the students will graduate this year. The family environment (a.k.a., community) begins with Principal Leslie Renne-Kegebein. In her building, they do life together. Students know Leslie intimately. She openly shares her own family’s celebrations and struggles with her students. They laugh and cry together, and she disciplines them as if they were her own children. This includes creating boundaries for students to prepare them for “real world” limitations and expectations. There is an atmosphere of tough love where students accept the consequences for their actions. To make this family-community successful, students must feel safe. There is zero tolerance for fighting or drug/alcohol abuse at the school. Students have even been suspended for threats made. This can be a difficult stance to take at times but is what creates the safe environment for her students. “I interview every kid who wants to come to school here and I don’t take them all. It is important that it is a good fit for both us and the student,” Leslie explained. “I give them options and they can come back for another interview later.” Not only are students getting second (or third) chances in their education, they are also getting a chance to grow socially and emotionally. that allows non-traditional learners to reclaim their academic focus. The 10-member staff, many on a first-name basis with students, follow Leslie’s lead and do what is necessary to best serve this population. Teachers at Madison Prep are compelled to be more than educators as they assist their students academically, socially, and emotionally. Yet there is very little staff turnover here. Counselors are available to help students with schedules and to plan for college and adulthood, and a social worker comes once a week. Many students have very little supervision, receive free or reduced lunch, and take care of siblings while their parent works. There is no time, money, or energy for sports, the arts, or other after school activities for these students, including staying after to get additional help with school work. Even with these hurdles, students are growing academically in the classroom. The staff works hard at helping students fill the gaps in their academic journey. Students can earn credit during four nine-week grading periods. If they get too far behind in one quarter, they can begin again the next. Leslie’s website has a Winston Churchill quote that reads, ‘Success is not final, failure is not fatal; it is the courage to continue that counts.’ The students at Madison Prep are continually encouraged to keep going, whether at failure or success. Two programs have improved student achievement at Madison Prep. 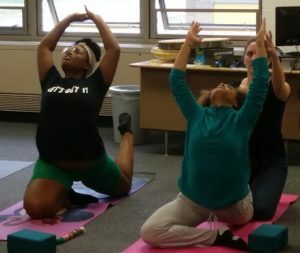 The first, a partnership with the St. Clair Butterfly Foundation, has provided yoga and art therapy to students once a week. St. Clair Butterfly Foundation, a local non-profit, assists at-risk youth in finding their voice and unlocking their potential through mentorship and skill development programs based in the creative arts. Students look forward to taking these classes and every quarter they are full, even though students don’t receive credit. High schoolers are willing to miss a regular class and make up the work, just to participate in a yoga or art therapy class. Because these creative arts classes are so popular, an after-school creative writing class was started where students can publish their books. These creative outlets give students freedom and control over this part of their lives and have allowed them to be more successful in their other academic courses. The second program that has made a drastic improvement in student achievement is their Friday schedule. The school applied to run a seat time waiver program where students attend four full days and a half-day on Fridays. Students can leave the building at 11:45 am on Fridays or stay the afternoon for Open Instruction. For safety purposes, once a student leaves the building on Fridays, they cannot come back until Monday. It is during this three-hour time period that students receive one-on-one or group tutoring, recover absences (can make up two missed classes per quarter), make progress in an online class in the lab, work on a project, or complete homework. Students who typically cannot come to school early or stay late now have the ability to get their work done “during” school. In its second year, more students are staying than leaving. “The building used to be a ghost town as soon as the 2:45 bell rang. Now students want to stay,” shared Leslie. Students no longer have an excuse for not keeping up on their work. The benefits of the Friday open instruction time goes beyond students keeping up in their classes. It has given students ownership of their learning with time for staff to guide them. Absenteeism has gone down and the class completion rate has gone up. There is even participation in “after-school” clubs which can meet during that time. 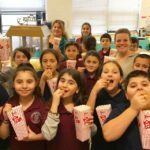 Something as simple as changing a schedule has personalized education for this group of students and has allowed them to grow both academically and emotionally. Madison Prep provides a safe and caring community where students are fed and can grow socially and emotionally. Students learn that through hard work they can be successful students, earn their high school diploma, and be proud of the individuals they become. For students who want a non-traditional personalized educational experience, MDPS offers SOARCE (Students learning Online with Academic Resources and Community Enrichment). Through this program, students take online classes from home or enrich their learning with community resource courses. Many home school students enroll in the program, but any student within Oakland County or any county contiguous to Oakland County are eligible to apply. In the SOARCE program, parents provide transportation to class, if required, and stay with their child during the class. MDPS provides curriculum, teachers, and educational plans for students getting a diploma. To learn more about the program, MDPS has multiple registration days in the spring and fall. If interested in enrolling, families complete an application and meet with a SOARCE staff member to submit the required paperwork. A meeting then occurs between the families and SOARCE staff to develop the student’s Educational Development Plan. Students and their families attend an orientation session before beginning their courses. Variety and flexibility are key in creating personalized learning experiences for the 288 K-5 and 487 6th-12th grade students. To meet the needs of all students, MDPS has increased dual enrollment, online, and community resource options. Like home school partnerships, families bring course ideas to the district and SOARCE staff create a syllabus and online curriculum for the elective courses. These community resource courses are where personalization occurs as there are many vendor options with one to a few students participating in each class. Madison’s focus is on customer service for their students and families. The superintendent of MDPS asked the SOARCE staff to read the book, The $6,000 Egg which focuses on 10 golden rules for customer service. While the comparison between running a business and running a school system can be debated, how customers want to be treated is no different. Families who enroll in SOARCE like that Madison makes school work for them through a variety of options and flexibility in schedule. They also appreciate the time staff takes to develop a relationship with the whole family. Students have various options when taking 100% online courses in the SOARCE program. The district partners with online vendors including GenNet, Lincoln Interactive, Edgenuity, Odysseyware, Michigan Virtual, Fuel Ed, and is looking into adding Florida Virtual School. The district also uses the vendor teachers in addition to their curriculum. While SOARCE does not have a drop-in facility, students can come to the office, located in the middle school building, for testing and when they need help. MDPS would like to provide a drop-in center in the near future to accommodate the growing number of online students. 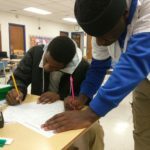 In addition to providing curriculum and teachers, every student in the SOARCE program has a mentor. Depending on grade level, students are assigned to one of four staff members. Each week the mentor and student communicate about their course(s). The mentor is also a source for assistance with technical problems or teacher/vendor issues. In this non-traditional education program, the district focuses on the needs of the learner. From what is offered to when it is offered to how it is offered, the student is in charge of obtaining mastery for their learning. That is personalized learning. When Keys Grace Academy was looking for a new home, Madison had just combined their elementary schools and moved into their newly renovated year-round facility. 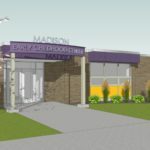 Rather than leaving the Edison Elementary facility empty, Madison formed a strategic partnership with Keys Grace Academy to provide services in the building to the area’s refugee/immigrant families. Keys, chartered by MDPS, provides a community-based model of education where the focus is on strengthening families as they teach and support students. As families flee war-torn countries in the Middle East and Southeast Asia, many settle in the Detroit area, which is one of the largest Iraqi refugee locations in the United States. Under the direction of Nathan Kalasho, Keys Grace Academy works with resettlement agencies in Michigan (Catholic Services Charities and Lutheran Social Services) to help the refugee families get established. In the process, they do much more than most chartered schools in the state. About half of the 450 K-8 students at Keys Grace Academy are immigrants. This year the school added a second classroom per grade as their enrollment almost doubled over last year. Even though all students are in one building, students in 6-8th grades switch classes like traditional middle schools. A 9th grade class will be added in 2018-19. While the physical building and schedule structure resemble traditional schools, refugee/immigrant families require a lot of additional attention and care. Almost all students at Keys have English as a second language (ESL) and are considered low income. Many of the immigrant students have not been to school for a few years. To address the language barrier, all teachers are bilingual with two ESL teachers solely working with students throughout the day on English. Writing and reading courses are also part of the daily schedule. Mesopotamian culture and Syriac classes are covered so students stay connected with their heritage. In addition to studying English and Syriac, students learn Spanish, becoming fluent in three languages. The community garden next to the school is planned, planted, and cared for by the students who then take the grown foods home. Neighborhood families are also welcome to pick produce from the garden. To address their poverty, free breakfast, lunch, uniforms, shoes, supplies, and backpacks are provided. One hundred percent (100%) of students take the bus to school, which picks them up at the end of their driveways. Medical screenings and dental services are available at the full-service health clinic at one end of the building, and there is a behavioral specialist and life skills coordinator on staff. As the focus is on strengthening families, a family resource center is in the building for parents to congregate and learn while their children are in class. Parent seminars are offered once a month with programs like ‘Expectations parents should have for their kids in school.’ Parents are also hired as bus drivers, custodians, and cafeteria monitors, many of whom take the bus to school with their children. Madison District Public Schools believes all students deserve a quality education and has embraced the cultural diversity of the area through its partnership with Keys Grace Academy. Keys offers many services that MDPS cannot provide to students and MDPS offers services and educational options unavailable to Keys Grace Academy. Through this collaborative partnership, the focus is on helping kids learn no matter where they are on the education spectrum. At Madison, it doesn’t matter if a child cannot afford to eat, cannot come before school or stay late, cannot speak English, cannot learn in a traditional setting, or is not at the “right” place on the learning spectrum for their age or grade level. The focus is on each child as an individual with an intentional focus to improve the lives of all their students academically as well as socially and emotionally. Preparing students for life include personalizing education for each student by providing options for their education and using data to help them succeed. That is how Madison District Public Schools is serving their families, one student at a time.